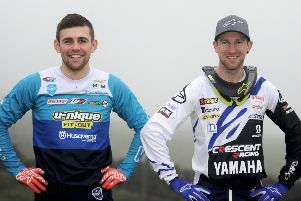 Martin Barr took second overall at last Sunday's Duns round of the MX2 British Championship. The weather at the weekend played havoc with all sport and the motocross didn’t miss with all the events getting their fair share of the heavy rain and wind. Following a five-week break the Maxxis British Championship moved into the second half of the series at Duns in Scotland and local rider Martin Barr just missed out on taking the overall win in the MX2 class. Billy Hutton Memorial Trophy winner Richard Bird (centre) pictured with Jordan McCaw and Stuart Nesbitt along with the late Billy Hutton's daughters Dawn, Heather and Denise. The Revo Husqvarna rider qualified fourth fastest behind championship leader Conrad Mewes on the ASA Hitachi KTM and in the opening race he finished third behind Josh Gilbert. In race two with the weather taking a turn for the worse and the track turning into a mud bath he claimed fourth after being held up on the last lap by back markers. “It wasn’t a bad weekend but it could have been better,” said Barr. “The track was perfect for qualifying and I set the fourth fastest time. “In the opening race I made a decent start lying fifth before moving up to third. As I was moving into second I washed the front and went down and dropped to fifth before battling my way back to third at the flag. “The rain was hammering down at the start of race two turning the track into a mess and although I didn’t make the best of starts I took my time and picked them off to move into second and a potential overall winning situation. Glenoe’s Glenn McCormick had the best result of his season when he finished eighth on the Watts KTM in race one at Duns and despite a non-finish in race two he was happy with his performance. “I qualified 16th and made a cracking start in the opening moto, lying third into turn one,” he said. “I stayed there for a few laps before dropping to fifth then I lost my goggles and couldn’t see, dropping to eighth. I did regroup and catch seventh but it was too little too late. “Race two was run in awful conditions. I was fifth away and someone cleaned my front wheel and down I went. There must have been three or four bikes on top of me and by the time I dug myself out of the mud the race was over. “In the same class Dundonald’s James Mackrel claimed 7th overall while Jason Meara finished 12th overall. In the MX1 class reigning champion Carrick’s Graeme Irwin qualified fastest on the ASA Hitachi KTM, over two seconds faster than Russian rider Evgeny Bobryshev but in his opening race someone hit the left side of the bike and bent the sprocket and chain guide. “The chain came off and there was no chance of getting back it back on,” explained Irwin. With the second race abandoned due to the weather it was a disappointing day for the champion. Meanwhile, Lisburn’s Richard Bird added his name to the prestigious Billy Hutton Memorial Trophy for the third time in his career as he raced his Five5 KTM to victory over Jordan McCaw and Stuart Simpson at a very wet Bells Hill last Saturday.